My wife likes it dirty. I’m referring of course to her martini. 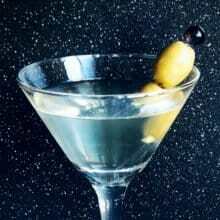 The “dirty” in Dirty Martini is due to the inclusion of olive brine in the drink. In a Boston shaker (or similar cocktail shaker), add 2-3 ice cubes. Add 2-3 ounces of gin (your preference). Add 1/4 ounce of dry vermouth. Add 1/2 ounce of olive brine (the brine in the jar of olives). Pour into a martini glass and garnish with 1-2 olives on a pick and serve. Note: It is incredibly important to add the olive brine into the shaker and shake. This is not a drink that you can stir it into after the fact.